I don't have time to elaborate on all of this right now as I'm preparing for dinner but I just wanted to say that this is an extraordinary conversation. You two have done something special here. Since many people have been asking me to elaborate on why I think IB is akin to Holocaust denial, I'll try to explain what I mean as succinctly as possible, by paraphrasing Roland Barthes: anything that makes Fascism unreal is wrong. For me, IB makes the Holocaust harder, not easier to grasp--as a historical reality, I mean, not as a movie convention. Insofar as it becomes a movie convention, it loses its historical reality. Greg - Thank you very much. That means a lot to me, and I'm sure to Dennis, and I look forward to you diving into the discussion. Mr. Rosenbaum - So is it fair to say that your approach to the Holocaust as an artistic subject is akin to, or somewhat close to, at least, Adorno's "poetry after Auschwitz" statement? If so, I can respect that, without personally believing it myself. But I feel like I'm either misreading you, or at least inflating the scope of what you mean. Bill, I agree with you about the performances, and specifically about Eli Roth. His getting slammed was predictable, given that he is famously Tarantino's friend, and given that, like his friend, Roth is successful, ubiquitous in the media, and never one to hide his light under a bushel. But I thought he was good in the movie. Physically, he doesn't live up to the hulking image conjured by the moniker "Bear Jew," and that does seem odd. Nor is he, say, a surprisingly puny shrimp whose swagger belies his myth and diminutive presence -- which might have been funny. Still, I thought he effectively projected righteous rage, especially in that final Tony Montana-like image of him (SPOILER!!!) machine-gunning Hitler's face to pulp. I think Adorno's point is quite different from mine. I don't object in the slightest to "Night and Fog" or "Shoah," both of which are works of art, and neither of which treats the Holocaust in a way that diminishes its historical reality. On the contrary: these films are acts of remembering. All that Tarantino or his movie can "remember" is other movies. But surely this is obvious. 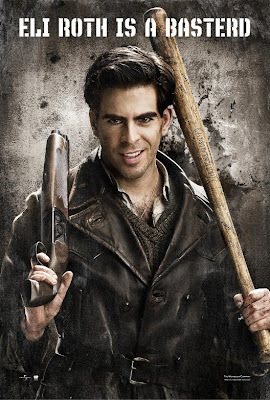 Don - I don't know that I quite thought of the disparity between Roth's appearance and the nickname "Bear Jew", because, really, Roth had the eyes for the role. He projected a very cold-hearted love for the job he'd taken upon himself. But surely not. A great deal of the conversation I've had with Dennis so far has been given over to what Nazism was and what the vengeance depicted in this film meant. Yes, the film is also about a love of films in general, but that's hardly all it's about. Haven't enough people discussed the film in other terms for you to at least consider that possibility? Further, Shoah and Night and Fog are obviously works of art, but they're non-fiction works of art. My question had more to do with works of fiction that deal with the Holocaust, and you're overall reaction to that idea. To Jonathan Rosenbaum: I would argue that the plot construct itself, revenge by Jews on Nazis, in fact supports acceptance of the facts of the Holocaust in as much as the revenge fantasy is meaningless without a Holocaust. Also, not to be pedantic, but there is an important difference between Fascism and Nazism, one in fact that supports racial subdivisions and so it is Nazism that in this case should not be made less real. Again though, it does not lose historical reality as it becomes a movie convention because it is the historical reality that allows the movie convention to exist with any power at all. "Insofar as it becomes a movie convention, it loses its historical reality." Greg: Thanks for putting succinctly what I've been trying to get at regarding what bothers me about Mr. Rosenbaum's comment. It seems he is coming very close to suggesting that a subject such as the Holocaust may not be put in the context of a fictional piece without it becoming a movie convention, and by putting it in such a context one causes it to lose its historical reality and significance. That's a mighty big chunk which to try and swallow, and it would seem to negate, or at trivialize, much of film history's attempt to deal with the "realities" of human history in a fictional context. I would be very interested in a demonstration of how exactly that happens, if this is indeed Mr. Rosenbaum's point. If it is not, then either he is being unclear or I am not up to the level of the discussion. I never said that fictional depictions of the Holocaust weren't permissable. By movie conventions I mean cliches or tropes drawn from other movies (and for me, QT can't do or imagine anything else). So this means that every time he claims to be dealing in some fashion with the Holocaust, he's filtering it through other movies, and other cliche-ridden fictional movies at that. Simply saying that the Holocaust existed or that people are discussing or arguing about it now is not the same thing as making it historically real, any more than Tom and Jerry cartoons can be said to depict real violence in the real world just because they show a representation of it via cartoon violence. And of course QT freely admits that historical reality couldn't be further from his mind or intentions. To get at that, I'm afraid you need something more than a ton of other genre movies. So I guess our disagreement is just over what we're willing to call historical reality. The reason why I quoted QT from his Rolling Stone interview is to show that he can only see 9/11 as another movie. If he's that far removed from recent reality, how can he be expected to see the Holocaust as something further away from movie fantasy? Perhaps. And I think this is where acknowledgment of Greg’s point is important—the indulgence of the revenge fantasy is impossible without acknowledgment of the context within which it exists. It's worth noting that this is not a movie “about” the Holocaust, but one which acknowledges it as the continuing impetus for the characters and the events that take place in it. In order to then make it historically real, is it true then that one is not permitted to take liberties with the facts of historical events that surround it? Tarantino is not suggesting by any stretch of the imagination that the documented reality of the Holocaust is any different than history and historians would have it. He is taking liberties, within the context of the cinematically self-aware wish-fulfillment revenge fantasy that he has mounted, with the fates of those who perpetrated it, liberties which, other than ending the war several months earlier than it would have anyway, do not significantly alter the end result, which is that the Allies prevailed. And I’m glad I didn’t post this before you added your words about Tarantino’s 9/11 comments. I too found those comments indefensible, at the time and now. But eight years have passed since he made them, and I’m willing to bet that, in retrospect, he might have some reservations about them himself. (I wonder if anyone has any knowledge of whether anyone in the press has ever asked him to comment on those comments.) Just as I believe QT has gained a measure of concern and ambivalence for understanding and dealing with the horror of violence in his films at the same time that he measures it out (which puts him in good standing with many directors who have taken exploitation film conventions as their partial subject), I would like to believe in the proceeding eight years he might have reason to understand that those comments, which may have been made out of a sense of confusion that most of us shared (and many of us are lucky not to have our initial reactions to such horrors laid down in print for posterity), didn’t reflect well on his sensitivity. I am not willing, however, to make the jump that he is incapable of seeing the Holocaust for what it is because of those comments. His 9/11 head movie is one left to those who care to speculate about it and what it means. 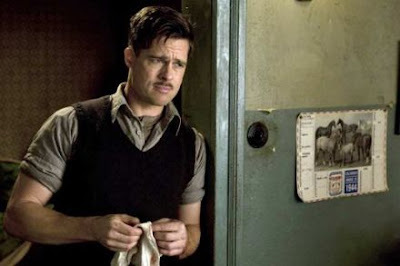 Inglourious Basterds is, for what we will all make it of it, right in front of us. I must agree with Dennis that I don't believe it is any filmmaker's duty to make historical events real. I realize you are not saying it is Jonathan but by consistently applying the negative critique that QT has filtered his history through other films the implication is there. May I take a moment to step back from the Holocaust aspect of the critique and ask how many films present a pure reality of anything in the first place? I don't doubt that The Godfather is a pastiche of many facts, rumors, legends and tales of mafia life but that doesn't mean - or more specifically it shouldn't mean - that I cannot enjoy the artistry of what is presented in front of me by the director, actors, cinematographer, et al unless real history is being presented, or at the very least not being diminished. Again, I realize you did not say fictions could not be produced but the question I am raising is what fiction would be acceptable according to the conditions you have set? It would seem to me any film that does not detail actual events using actual victims/eyewitnesses would fall short of the task. Wouldn't any film not using actual names and dates make the Holocaust less real by your arithmetic? I accept that there will probably be no resolution amongst us because I don't think we're having any problems understanding each other's arguments, just arriving at different conclusions based on deeply held convictions. I believe the film fails if the reality of the Holocaust is diminished. Since I believe the film succeeds I further believe it is relying upon the absolute reality of the Holocaust to gain its power. And let's face it, anyone counting on the movies to fill in for them the details of history is in dire straits indeed. Movies rarely document history but they often use history and the knowledge the audience already has of it to make a point or tell a story in a way that simple facts cannot. It's an iffy proposition at best and many films fail in this regard but I think QT made it work by using the audience's knowledge of the worst systemized mass murder in history. Just got back from seeing this. 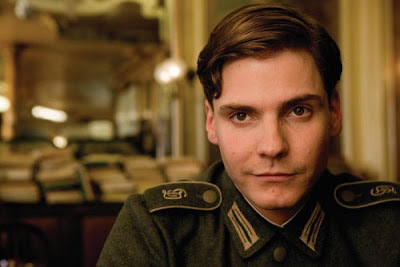 Am I missing something, or is Inglorious Basterds not a Holocaust movie? I didn't think it was...so why are we talking about it in regards to Tarantino's film? It's a WWII movie. There have been hundreds of WWII movies that have been made that haven't been about the Holocaust. I don't think you can disregard the obvious relationship between the two, but I don't think Tarantino is really making any kind of statements about the Holocaust with his film...until those final images in the movie theater. Like Jim Emerson said...this is not like Life is Beautiful. This is more akin to fantasy...like Red Dawn (and hey, Milius is even thanked in the credits). I don't know. I could be way off...and I really feel out of my league here considering the people who are voicing their opinion. I will now go back and read what you and Dennis have been talking about since I completely spoke out of context here and responded strictly to the comments here. Kevin - Yeah, even though I've talked at length about Nazi war crimes in this discussion, you're still %100 correct. If we're going to place this film in a specific genre, "Holocaust Film" is not the one anyone is going to choose first. While the Holocaust is foregrounded a bit more here than in most WWII movies, considering the idea of Jewish revenge, it's STILL a WWII film, and it is a bit perplexing that suddenly, because of the revenge element, some people have decided this is a movie about Auschwitz. Awww.... nothing like a Jeffrey Wells quote to go with my morning coffee. Though, I guess Wells' "men of honor" argument isn't so surprising considering that he adores Soderbergh's hagiographic Che films. It seems like it's easy for Wells to forget the sins of any figure when that figure is depicted in an "honorable" way on screen (although, I don't think QT is making Sammel look that way at all in that scene. He has a sneer on his face, not honor). P.S. And if I also opened a can of worms, I completely understand if you want to close it. Which can of worms did you open, Fox? Your further Wells bashing, which is a can I would never want to close, or the Che thing? I still haven't seen that, but I doubt a tempest will ensue anyway. Those battle lines were drawn a long time ago, and I doubt anyone's currently in the mood to start that debate back up. 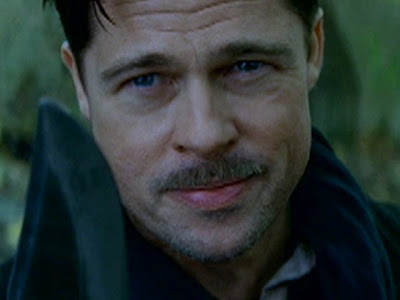 After all, we still have Inglourious Basterds to fight about! Oh, I guess I just didn't want to distract from the discussion at hand by getting in my jabs at Jeffrey Wells. It's probably because it's still early in the morning (for me), and I'm cranky. But bringing it back around to IB, is it me, or was the film really not so visually sadistic as people are saying? Maybe it was just my expectations that were undercut, but outside of the baseball bat scene (which, even then, I though QT held back on the viciousness... as silly as that may sound), and maybe the bullets chopping up Hitler's face like lettuce, I didn't think the violence was that visually nasty. For the most part, QT's camera doesn't linger on suffering like French horror and that genre's American contemporaries do. No, it's not that graphic. I mean, it's graphic, but I think "brutal" is probably a better word, but I think it's kind of at a standard level for modern war films. Where some people believe it gets dicey is the context of it all -- whose committing the violence and why, and the fact that we're supposed to enjoy it to some degree. Which, you may have noticed, is not something that particularly bothers me. Okay, I've finally read all this, and am happy to have finished my own piece so I have time to comment on this, a series of conversations between two of my very favorite bloggers. I find myself in an odd predicament with this movie --- I understand where the detractors, Rosenbaum included, are coming from; yet I don't agree with them at all, in spite of the fact that I would level some similar, but not quite identical, charges at the film myself. Rather, I find myself in agreement with those who are over the moon for the movie, even if I don't quite see what they see in it. It's a work that leaves an occasional bad taste in my mouth, but I don't think that's good enough reason to ignore its many virtues. I just feel like many of the people who don't like it aren't engaging with the movie on its own terms at all. So I agree with those I disagree with, disagree with those I agree with, and everything is all fucked in my world. I think that if we were to level the accusation that Tarantino was denying the Holocaust and WWII by turning it into a movie convention, we could level that at many Hollywood productions, including Spielberg's highly touted works of art-history, Schindler's List and Saving Private Ryan (more the latter, though). But I think he is presenting it as a movie convention to deconstruct it as a movie convention; simultaneously celebrating, spoofing, and turning a critical eye on the history of war in the movies. And yes, Tarantino sees life through the prism of movies. I don't think there's anything wrong with it because he's never denied it; films are just how he relates to the world. Taking away his typewriter and camera would probably take away his voice more than the removing of his vocal chords would. Unlike Spielberg, Tarantino doesn't deny that everything he knows about war he learned from movies. And I've always personally been against using Tarantino's somewhat regrettable public persona as a means to deny the depth of his movies; would it be fair to use what a jerk John Lennon was capable of being to discount the worth of his art? And, yes, I agree with you and Fox that the movie is nowhere near as brutal as it's been touted as, by both critics and its own advertising. I walked into the theater bracing myself for a bit of the old ultra-violence, and was happy when it was there only in fleeting instances. Surely it's no more violent than The Longest Day, The Dirty Dozen, or even Raiders of the Lost Ark. Great work from you two, and I can't wait for the next installment, even if it means that this enjoyable series must sadly end. @Jonathan: I have a lot of respect for your argument, but it would help if you'd cite even one fiction film about the Holocaust that lived up to your standard of not trivializing its reality (is there one?). Without meaning to be deliberately perverse, I could argue in return that IB -- by virtue of its unmistakable 'movie-ness' -- is morally preferable to Schindler's List (let alone Life Is Beautiful), because inadequacy to the historical record isn't an issue in unabashed fantasy. At least Tarantino is free by definition of the peculiar hubris that leads filmmakers to accept Oscars 'on behalf of the six million,' or some such -- as if making a movie about the Holocaust were equivalent to having *done* something about the Holocaust. I can't remember whether Spielberg said anything of the kind and don't want to misrepresent him, but he's certainly no stranger to the Hollywood fallacy of acquiring moral stature by osmosis. 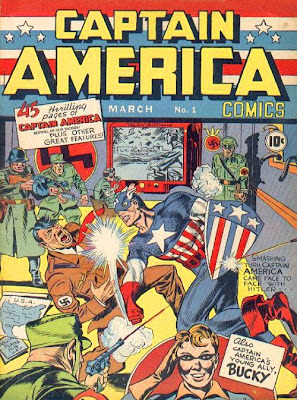 Also, you know better than most that QT didn't exactly invent the idea of using WW2 as grist for exuberant pulp. I grew up on countless comic books and shlock movies that did exactly that, and so did Tarantino. That -- and not the 'real' World War 2 -- is what he's simultaneously enshrining and (sigh) deconstructing here. Since the meretricious version of WW2 has its own cultural reality and even heritage -- e.g., I know The Great Escape's boyish high spirits are an insult to the real escapees, but love it all the same -- isn't it as valid a stimulus to a filmmaker as anything else? I've lodged plenty of complaints on my own about "Schinder's List," but if you want me to cite one fiction film that at least touches on the Holocaust and does so respectably, made by a witness to its immediate aftermath, I'd point to Fuller's "The Big Red One". I don't object to Polanski's "The Pianist" either, though I wouldn't describe it as one of his best or as any particular favorite of mine. However, for politically incorrect stuff about Nazis, I'll take Paul Verhoeven's glorious "Black Book" over "IB" or anything else QT could ever dream up, any day of the week. And Verhoeven qualifies as a direct witness, too--even if, like Polanski, he was just a kid at the time. Does this mean the filmmaker has to have been, in some way, a witness before their fictional representation meets your standards? You hadn't mentioned that as a criteria before, but you're stressing it now. If so, that's fine, I guess, but it also means Tarantino's film had been judged unacceptable before you even saw it. I just can't agree that that's what he's doing. Do you think killing Hitler was in any way Tarantino's way of pointing out that historically-based movies often get the facts wrong? Not directly, no, though for me that was certainly one of the results of him doing something so blatantly outside of the canon of history. I just feel that, if more movies were more honest, they would have done the same thing. 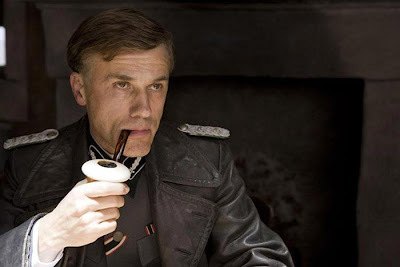 You can't tell me Valkyrie didn't want to kill Hitler... they just couldn't, because the film makers didn't have the sheer gaul necessary to subvert history in that way. Turning history into a dumb action spectacle is okay, but twisting the facts around a little to give the story a more complete narrative arc isn't. It's refreshing that Tarantino doesn't confine himself to an arbitrary set of rules, because that makes the movie all the more satisfying. But you don't think Tarantino is turning a more critical eye towards genre in his last two movies? That was one of the things that particularly struck me about Death Proof. You can celebrate a certain genre and still correct perceived 'flaws' within the genre. A big one for me in IB is that people actually speak in their native tongue, instead of speaking English in whatever accent the character has... something that indicates Tarantino has a lot of respect for language, another thing not generally discussed with all these 'style-over-subtance' claims lobbed at him. Ah, well, no, I don't actually disagree with that. I thought you meant something more academic, or more overtly "meta" (shudder!) than that. Regarding Death Proof, which I didn't like very much overall (as I've said again and again) the greatest piece of subversion of genre he achieved in that was the car crash murder of the first group of girls, because it takes slasher movie violence, which is at some level meant to be laughed at, and made it hurt again, maybe for the first time since The Texas Chainsaw Massacre (probably not the first time, but I can't be bothered to look into it). And what was so great about it is that it could function as a comment on the genre without ever feeling or looking like a comment on the genre. But I'm just repeating Dennis now. Short version is, okay, Ryan, I see your point. I find the "direct witness" criteria a bit screwy if I may say so myself. Under that guideline no movie can ever be made about any topic predating the birth of the director without diminishing its historical reality. Huh? But more importantly, The Big Red One and The Pianist have actual concentration camp scenes. This, undeniably, states that according to JR's view any film taking place during WWII that does not contain recreated footage of the camps diminishes the historical reality of the Holocaust. I am sure this is not the intended view of Mr. Rosenbaum but unfortunately this is where his rather unfocused arguments have led us. I simply haven't seen anything stated that confirms the orginal statement or in any way explains why IB is akin to Holocaust denial except misdirection and circular reasoning. @Jonathan: I'm a huge admirer of The Big Red One, especially the reconstructed version. The Pianist, like you, less so -- I think it's pretty admirable in many ways, but also unexpectedly conventional and impersonal for a movie on a subject so painfully close to Polanski's heart. I also liked Black Book very much, and can see good reasons for preferring Verhoeven's "political incorrectness" to Tarantino's. But at that point, aren't we just disagreeing about taste? That's fine, and I'd be out of my league in a hurry up against a critic as formidable as you. But it's also a good few rungs down the ladder -- and maybe blessedly so -- from whether IB amounts to Holocaust denial by other means. Gentlemen, sorry to have had to be out of the mix today and thus miss out on taking part in the conversation. I have been in the bosom of family this afternoon and I cannot complain. But I would like to check in briefly. Well, it does seem that this is the conclusion to which this logical argument has arrived, whether it is the intended conclusion or not, and that’s disappointing, to say the least. It seems that to follow this path is to understand that there can be no historical reality at all in the movies. Of course, movies are inherently “unreal” (we all know the reasons why), so even nonfiction depictions of historical realities deemed acceptable under Mr. Rosenbaum’s standards, such as the Holocaust or, say, the United Mine Workers strikes, are as much at risk of dishonor as a fictionalized movie about a historical subject made absent of one (a director, a writer) who was a direct witness to that history. (Pauline Kael, it’s worth remembering, had issues with Claude Lanzmann’s Shoah, that were heavily attacked by the movie’s supporters.) So I guess we’ve pretty much sealed off the value of the western or any other movie dealing with a period of history that takes place any time roughly before 1920. “As Elie Wiesel, Nobel Laureate and most important witness of the Kingdom of Night, teaches: ‘Some stories are true that never happened.’"
I offer these quotes from Kula having no idea if he is right or wrong, and I certainly do not offer them to once and for all denounce Mr. Rosenbaum’s point of view. I just find it interesting that a rabbi, who again may not be representative of the general position of Jews on either the Holocaust or Quentin Tarantino, can at least find room to consider that the movie might be something other than an abomination or evidence of perpetuating evil in the face of, and at the expense of, yes, historical reality. Ah, well, no, I don't actually disagree with that. Bill... you're scaring me! Are you feeling okay? I thought you meant something more academic, or more overtly "meta" (shudder!) than that. "Formalist" is more the word I'd use, but as has been pointed out the movie works on many different levels than the formal one. To me, it's just something that gives the movie a lot of richness and depth. But people won't accept depth because it comes from Tatantino, who for whatever reason is treated as the village idiot of film directing.